The Garmin Edge 500 is a full featured GPS-based cycling computer that’s mean and lean. This little wonder will give you all the ride information you need in an easy to use and downloadable package. Aimed at keeping a low profile on your bike in high profile races, it has all the features you would require in a GPS enabled bike computer. It displays the speed, trip time, elevation, distance traveled, and much more in real-time. It can also be paired with ANT+ sensors which detect your pedal power, pedal cadence and heart rate. What this means is that you can monitor all your training levels in real-time and make sure you are working at maximum efficiency. The biggest draw for the Garmin Edge 500 by far over any other Garmin Edge computer has to be its size. At a weight of just 2oz, it’s one of the tiniest cycle computers available on the market. With its 4.5 centimeters diagonal screen, you don’t have to worry about its size or weight slowing you down. High sensitivity GPS receiver capable of Hotfix® satellite prediction for faster calculation of your position. The Edge 500 comes with a tiny GPS receiver which allows for the display of both location information and record information on where you have been. This helps determine things such as distance and speed without requiring any additional hardware (such as speed sensors on the wheel). During your bicycle ride, the Edge 500 will measure your speed, time, distance, calories burned, descent, altitude and climb and then records all this data for you to review later. All Edge 500 devices work with third-party ANT+ enabled power meters so as to display the power output in watts as one ride. This valuable data collected will show you how hard you are working, regardless of the conditions affecting the ride, so that you will be able to train smarter. Certain versions ship with digital heart rate monitors and cadence/speed sensors. The Garmin Edge 500 is also capable of Auto Lap. Auto Pause and temperature readings. The Edge 500 features a barometric altimeter for precise measurement of elevation, descent and climb data. It records this data for every track activity and presents it virtually any sports application out there. For its price, The Edge 500 offer great functionality. It has one of the most advanced heart rate-based calorie computation. It is compatible with ANT+ power meters. The Barometric altimeter gives very precise climb and descent readings. It’s not waterproof to the point of submerging it. It lacks Virtual Partner which normally allows s users to pace against other virtual partners so as to keep a consistent pace. 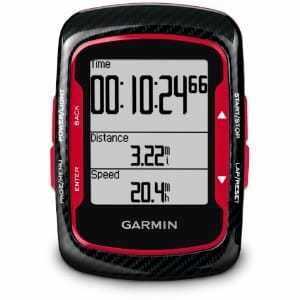 Q: What do you need to use the Garmin Edge 500 on another bike? A: All you need is the Computer mount as well as the cadence/speed monitor. You should then sync it up which is quite easy. Q: Does the Garmin Edge 500 model have the option of maps? A: No, for this feature one has to go for the Garmin Edge 810 versions; however they have a different screen type which can be hard to see in a full sun when biking. Reading the Garmin Edge 500 review you already know that, this is a very reliable bike GPS, which offers excellent value and functionality. You will not get any extra fancy features, such as touch interface, a color screen, smartphone navigation or maps navigation, but if at all you just need all the basic features, the Edge 500 offers great value considering its low price point. Looking for much better GPS Bike Computer??? Check out Top Ten GPS Bike Computer Reviews with Comparison Chart.